What happens when a much loved magazine joins hands with a favorite store & they pick up a subject that is very close to my heart? Flutter.Flutter. Yes, that's my heart fluttering because of all the excitement. Good Homes and Fabindia are getting together to conduct a workshop where they will be exploring creative ways to Reuse and Revamp. How lovely is that! Going green by reusing, restoring and recycling has always been my mantra. I have lost track of the number of posts I have written on the subject in the past. So when the team at Good Homes wrote to me about this workshop I just had to share it with all of you. 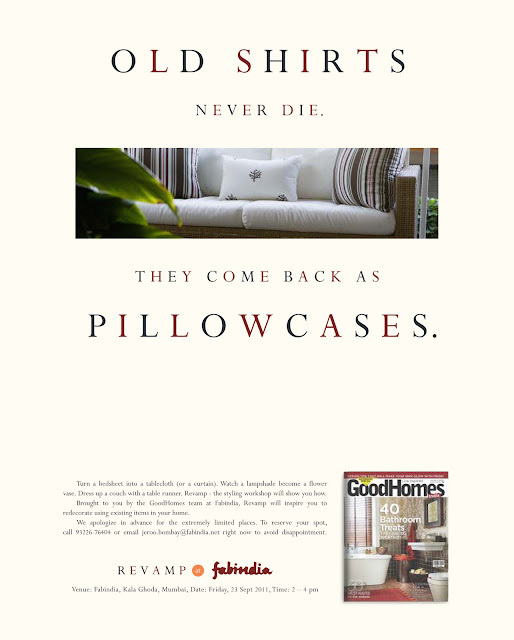 Converting old shirts into pillowcases, reusing lampshades as flower vases...that and more is in store for you. What fun!